The Water Agency was honored to soft launch the first version of the Myanmar Water Portal (MWP) during the Greater Mekong Forum in Yangon in October 2017. Based on the continuous interactions with Myanmar and International stakeholders, we have improved our knowledge and collaboration services for the Myanmar Water Sector. Since the beginning of this year, we also commenced publishing the Myanmar Water Journal to further enhance stakeholder collaboration; this free monthly newsletter is a summary of interesting news, articles and events about the Myanmar Water sector. We reach out to more than 1000 water professionals interested in doing business in Myanmar. Connectedness is the defining success factor for the global water sector. Connectedness enables sharing of knowledge, commitment, learning, innovation, collaboration, transparency, accountability, etc. The Myanmar water sector has a unique opportunity to leapfrog by embracing digital technology as a key enabler and accelerator for progress. The Myanmar Water Portal aims to be the digital gateway that connects local and international water professionals and enables them to discover, share, learn and collaborate. The Myanmar Water Portal is accessible 24/7, supporting desktop and mobile devices. The platform is a public site as well as a secure member-only community. The Myanmar Water Portal provides an online home to the Myanmar Water Community of Practice, the Myanmar Water Hub and the Myanmar Water Academy, allowing its members to effectively share information, build connections, coordinate agendas, plan events, access market intelligence, look-up projects, consult directories (e.g. who's who), etc. The Myanmar Water Portal (MWP) is a foundational platform to coordinate, strengthen and promote all the valuable work that is happening in Myanmar in the area of water. The Myanmar Water Portal is currently the 'home' of more than 100 stakeholders as it provides daily updates on Myanmar Water related news, documents and projects. The Myanmar Water Portal has been developed and funded by The Water Agency with the ambition to encourage and stimulate more effective collaboration amongst all stakeholders active in Myanmar. We have receive positive feedback from the Myanmar water community and we would like to upscale our service to further support the Myanmar water ecosystem. We are proud on the reporting around the visit of the Chief Minister of Yangon Region to the Netherlands and Community of Practice Session in partnership with YCDC facilitated by our Australian colleague Dr. Piet Filet, Founder of Flood CoP. The Myanmar Water Portal has online members from all around the world. They are government agencies, private companies, universities, research institutes, NGOs, start-ups and independent experts. Some are based in Yangon, some are not (yet). But they all share an active interest to make water work for Myanmar: healthy rivers, safe coasts, prosperous ports, resilient cities and communities and clean water for all. To meet the growing needs of the Myanmar Water Community and to strengthen the Myanmar Water Portal further, your endorsement and contribution is crucial. We are very pleased with the growing number of leaders that are supporting our journey towards better collaboration and transparency in the Myanmar Water Sector. 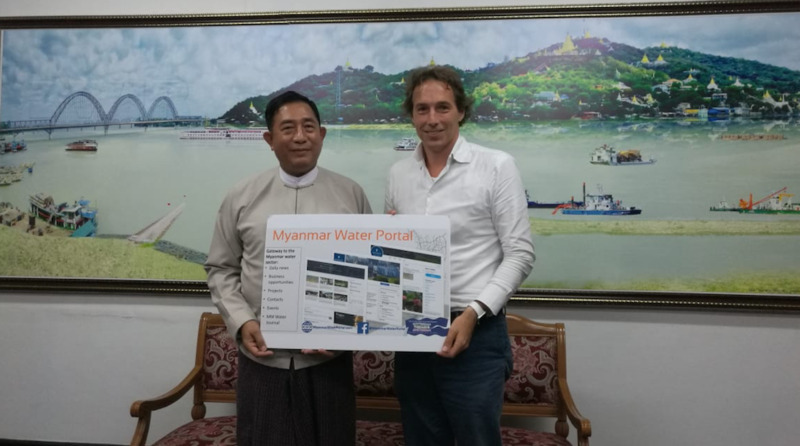 This month ​Director General Htun Lwin Oo of DWIR, also embraced the Myanmar Water Portal to be embedded into the communication and reporting structures of DWIR activities. He emphasized the importance to create more opportunities for connectivity and better cooperation – and to share all the valuable and meaningful work that the Myanmar water sector is doing; in Myanmar and abroad. The Water Agency is a true believer in collaboration, transparency and young professionals. 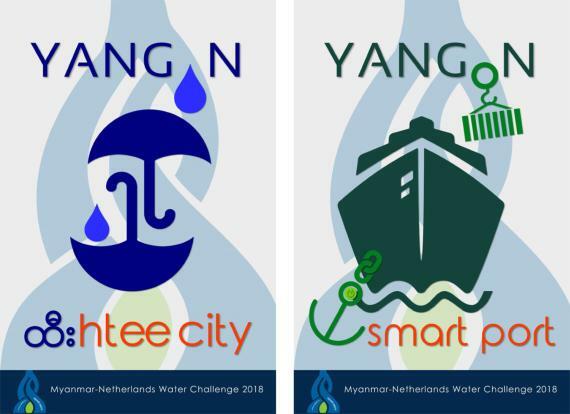 Last month more than 150 Myanmar students were engaged via the Myanmar Water Portal to upload their articles and motivation letters for the selection of Myanmar Netherlands Water Challenge 2018 program. Please find a summary of the engagement day at the Dutch Embassy with 44 Myanmar students of 13 universities at the Myanmar Water Portal. The Water Agency works from the Impact Hub Yangon – and is part of an ecosystem of entrepreneurs that have an interest to make an impact for Myanmar (and potentially Asia). Last week the Impact Hub became a Water Hub for an evening as we facilitated a very important dialogue around Sustainable Water Management for Myanmar with over 20 passionate water people. MRTV-4 was broadcasting the event to learn more about the growing importance of collaboration in the Myanmar Water Sector. The Water Agency involved (and selected) the first active stakeholders for a free Myanmar Water Portal 'membership' package for 2018 - including a dedicated person who can facilitate this process for their organization. 1 publication per 3 months in the Myanmar Water Journal. 1 interview (cover) story; including partner page 'featured' on home page. Unlimited event publications on event calendar; we are exploring options to partner with a team of (young) water reporters to be able to report on all ongoing events / activities / workshops. Providing you the latest news, insights, opportunities and events from the Myanmar water sector.